Since 2006, the Henry R. Kravis Prize in Leadership has been building a special community among its recipients, whose premier organizations are dedicated to improving the lives of millions of people around the globe. That community also extends to Claremont McKenna College’s students, who will have a chance to learn about working with past Prize recipients in the summer of 2015 during the Kravis Prize Internship Fair, which will be held this Thursday afternoon, December 4, 3 p.m. – 4:30 p.m., in the Freeberg Lounge. Find out about Kravis Prize internships offered both domestically by BRAC USA and Helen Keller International (both in New York City) and internationally by Right To Play, Escuela Nueva, FAWE, Pratham, and INJAZ Al-Arab (Canada, Colombia, Tanzania, India, and Jordan, respectively). The internship program, which is the result of a partnership between the Kravis Prize and the Kravis Leadership Institute at CMC, has enabled CMCers like Carolyn Islam ’16 (pictured above during her internship last summer with BRAC in Dhaka) to receive firsthand experience in problem-solving and applied entrepreneurship as it’s practiced by leaders in the non-profit sector. Students attending Thursday’s internship fair will receive additional internship details, information about the application process, and also have a chance to listen to the stories of classmates who have already participated in this singular internship program. What does Pratham do? 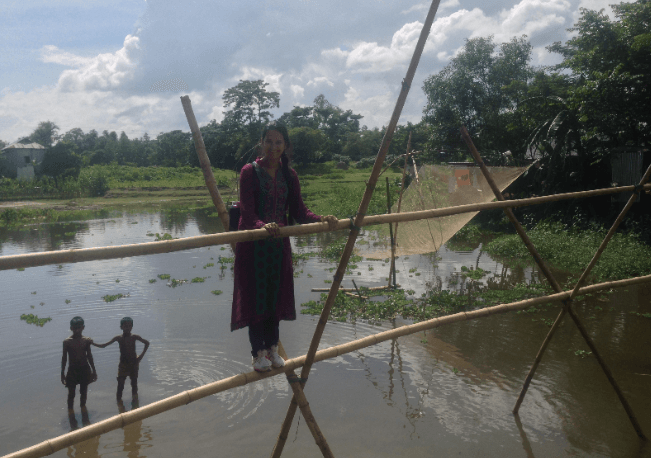 What is the Bangladesh Rural Advancement Committee (BRAC) all about? What organization interests you? Learn more about these past recipients and others by visiting the home page of the Henry R. Kravis Prize in Leadership at Claremont McKenna College. Greetings from Dhaka Ahsania Mission (DAM) Bangladesh! We the Dhaka Ahsania Mission (DAM) Bangladesh interested to submit application for the prestigious Prize/Award on behalf of Mr. Kazi Rafiqul Alam, President of Dhaka Ahsania Mission (DAM). Mr. Alam making multi-faceted contribution in the development field during the last three decades, focused particularly on improving the quality of life of the socially excluded poor. His contribution, particularly in two areas, stands out prominently: (i) Education and (ii) Health. Through his hard work, dedication and tireless efforts he developed Dhaka Ahsania Mission to where it is now, one of the largest NGOs in Bangladesh, perhaps, next to BRAC, and ranked 76th among the Top 100 NGOs in the world as rated by The Global Journal Switzerland in 2013. Mr. Alam’s contribution ranges from nation-wide grassroots development initiatives to setting up of educational institutions including formal schools, colleges, teachers’ training college, a nationally reputed engineering university, a children city (for street children), and a non-profit 500-bed cancer hospital of international standard through People’s contributions. Patients receive treatment at a subsidized rate and 30% poor patients get free treatment. Mr. Alam established several drug treatment and rehabilitation centres (one for females), and mother & child hospitals. DAM’s health programme has in fact covered 5.4 million beneficiaries in the last three decades. The use of multi-grade teaching learning approach in non-formal education has been an innovative adaptation by DAM. DAM is also widely known for its innovative model of People’s Centre (Ganokendra) as village level education providers. So far 4193 such centres have been established and fully functional spreading over 46 out of 64 districts and around 807 Ganokendras are in the process of taking off. Under his leadership, DAM developed around 739 titled materials on literacy, awareness raising and teachers’ training manuals to support Gonokendras’ lifelong learning. DAM’s education programme has in fact given opportunities to 10 million learners to get into education mainstream in the last three decades. In addition to that others (livelihoods, human rights & social justice) are 5.2 million and in total 20.7 million beneficiaries have so far covered. It will be highly appreciated if you kindly provide us the application form and submission date, guidelines for application preparation and submission process. Thank you for your message and congratulations to Dhaka Ahsania Mission (DAM) and the efforts of Mr. Alam in improving the health and education of folks in Bangladesh!